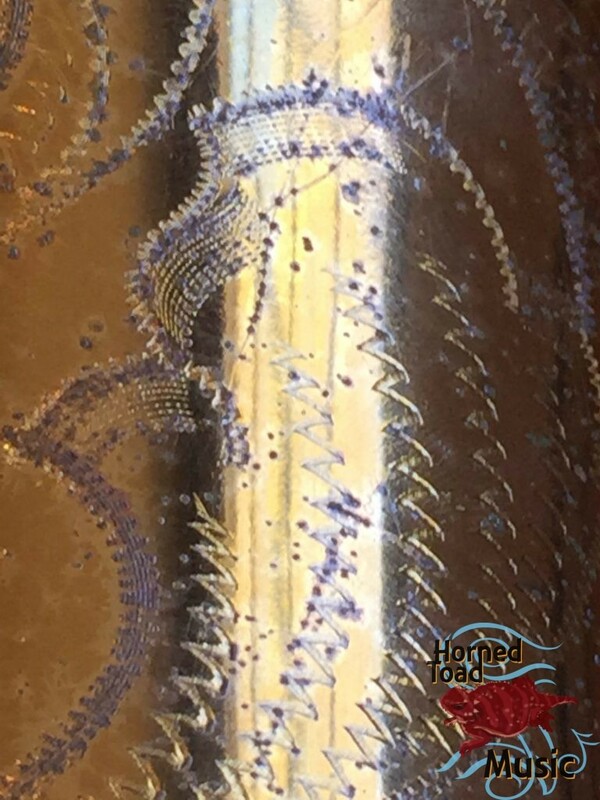 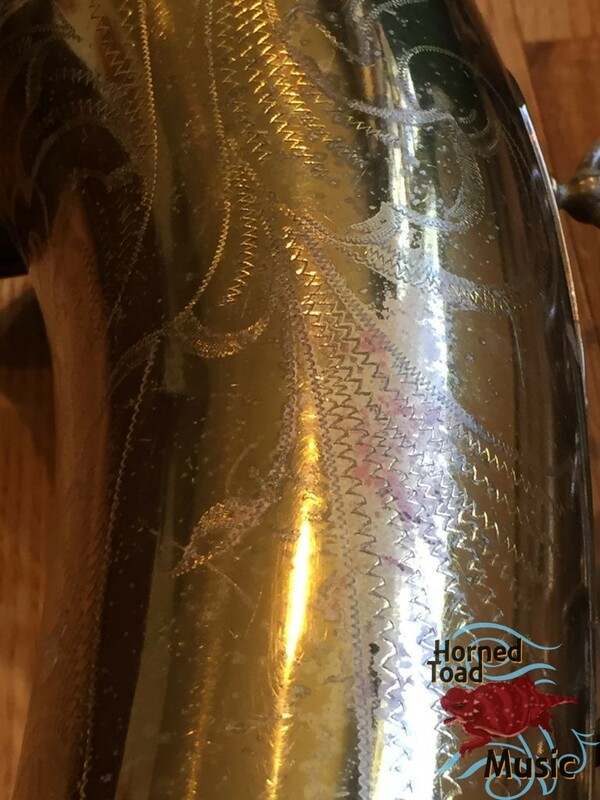 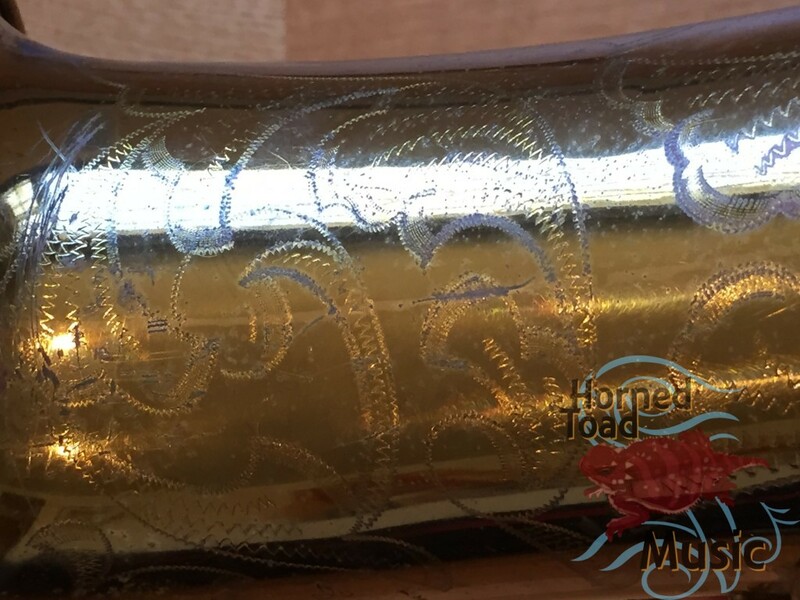 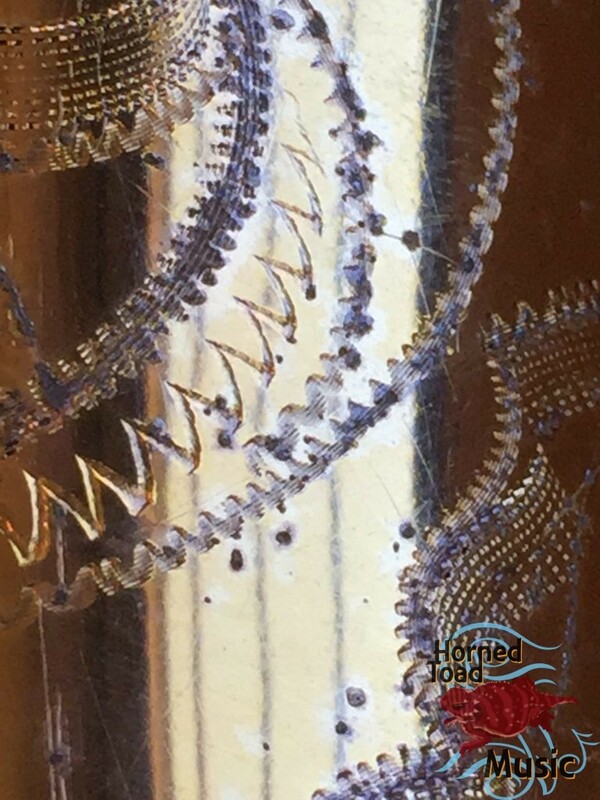 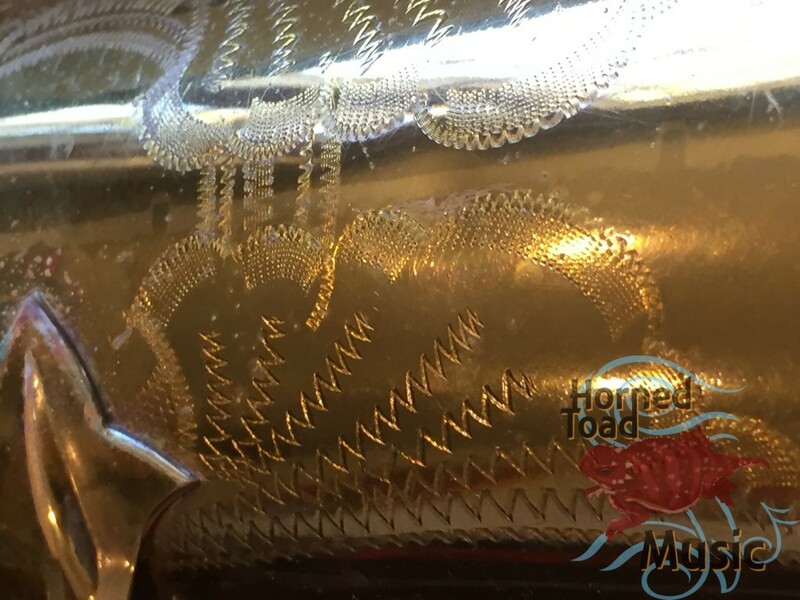 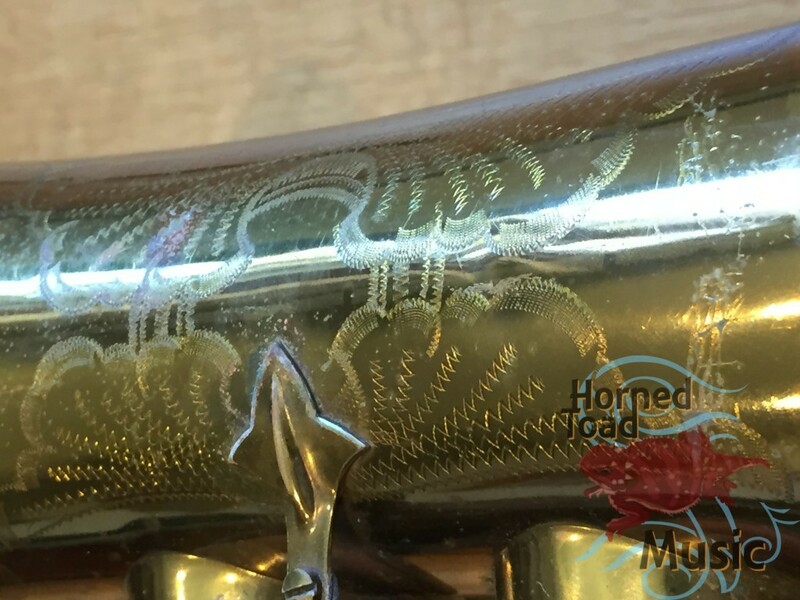 This is a once in a lifetime horn, these kinds of horns do not come available very often or easily. I bought this tenor in maybe 1997 or thereabouts. 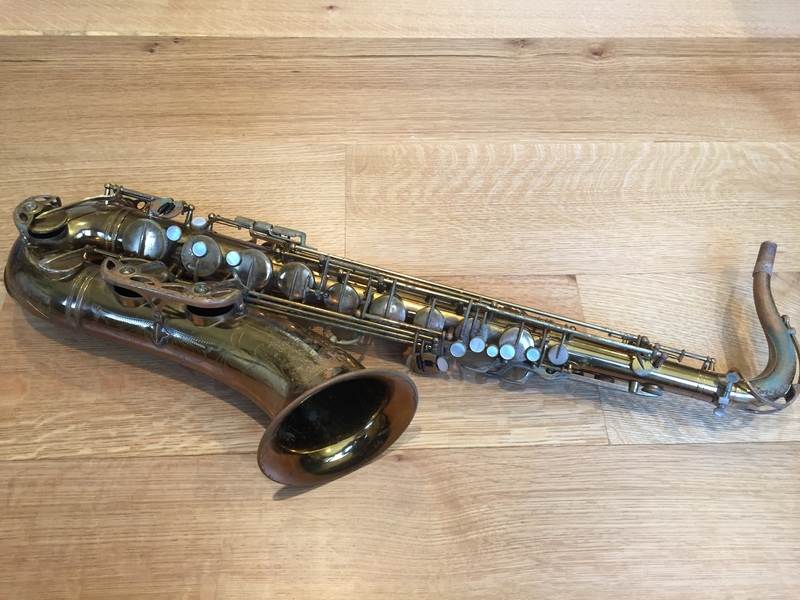 It was the first MK VI I had ever played which could get me to sell the 54xxx SBA I had been playing for years. 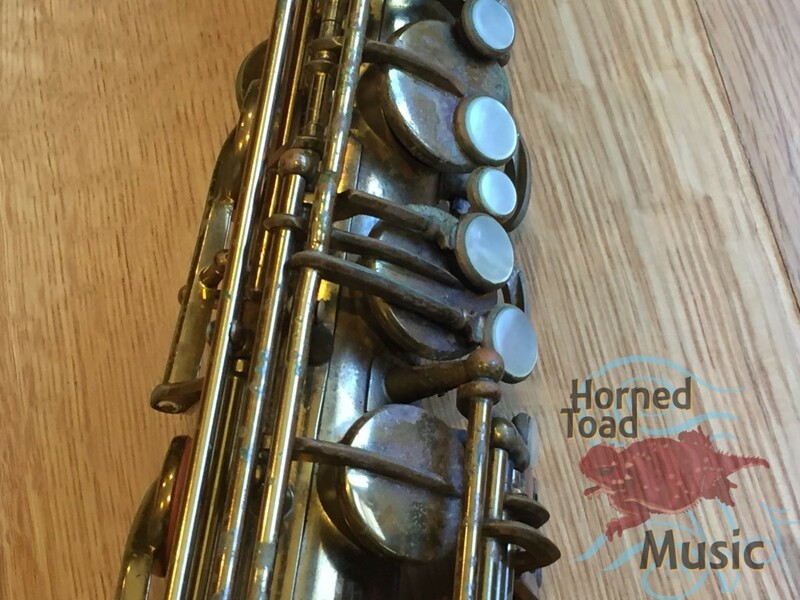 When I played this for first half a second I knew my love affair with the SBA was done. 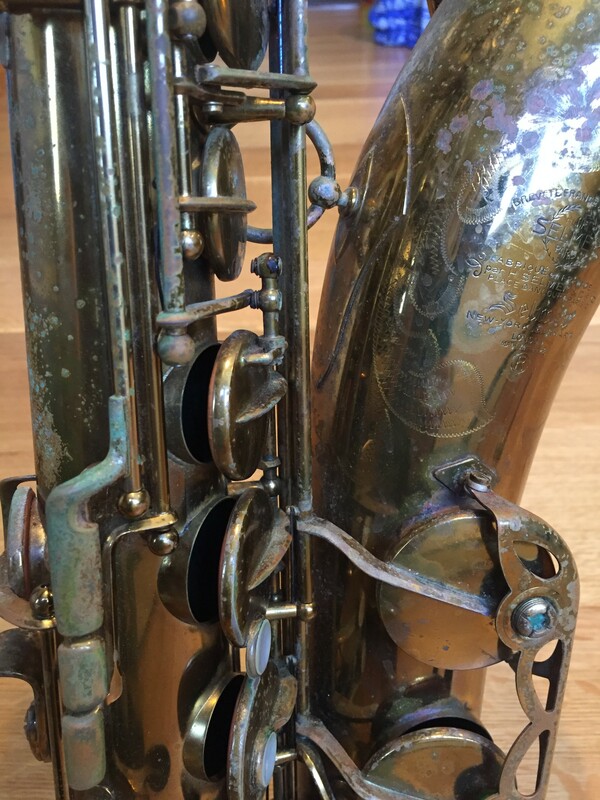 1956 is the year of production and the dark lacquer finish is all original. 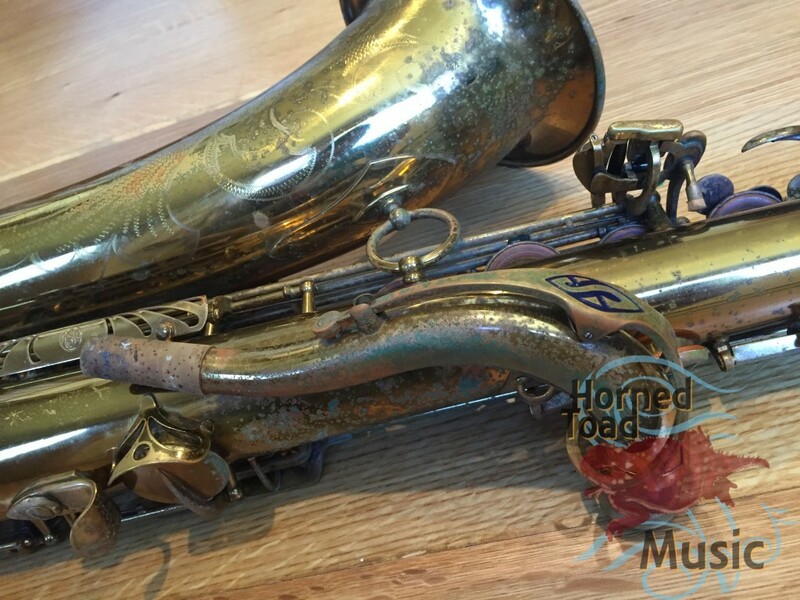 The horn HAS been played of course, but generally it is in very good condition. It has a number of very small and insignificant little dings but no major repairs of any kind. 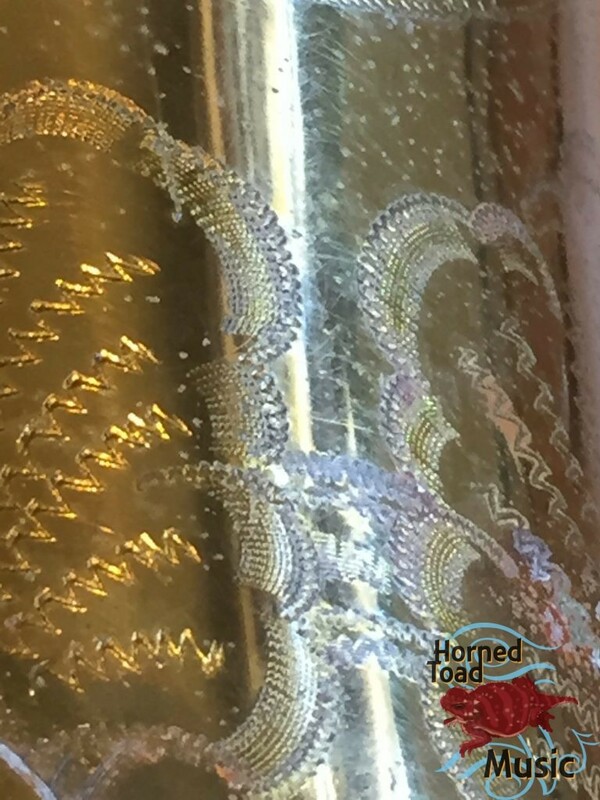 The pearls do not have much if any wear. 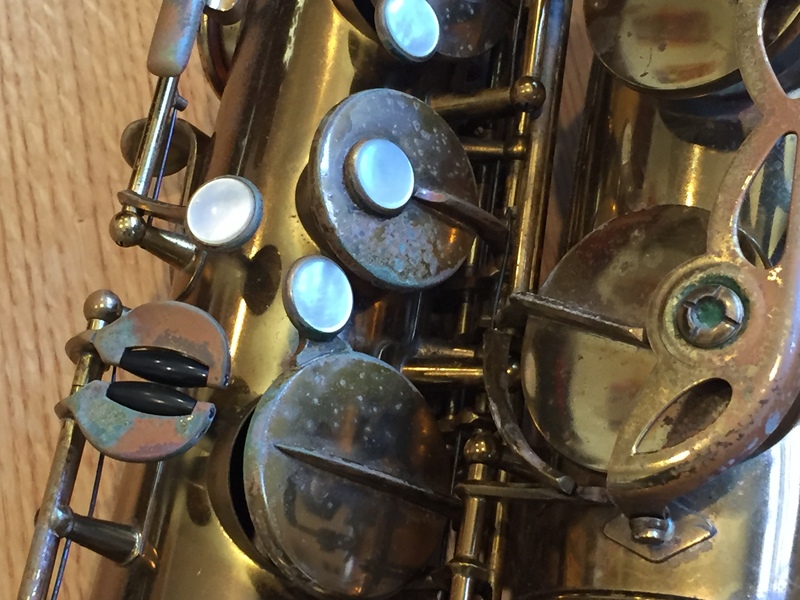 The pads are old, but still very functional, and could still be that way for a long time. 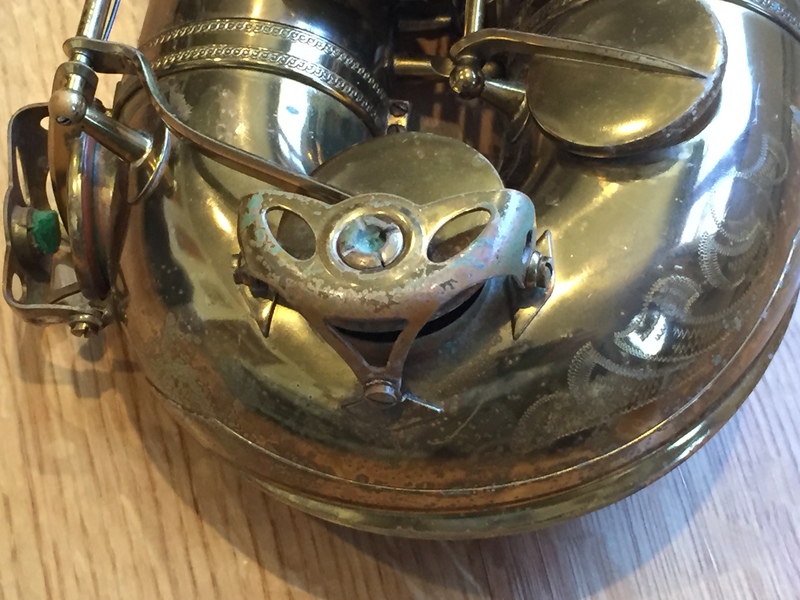 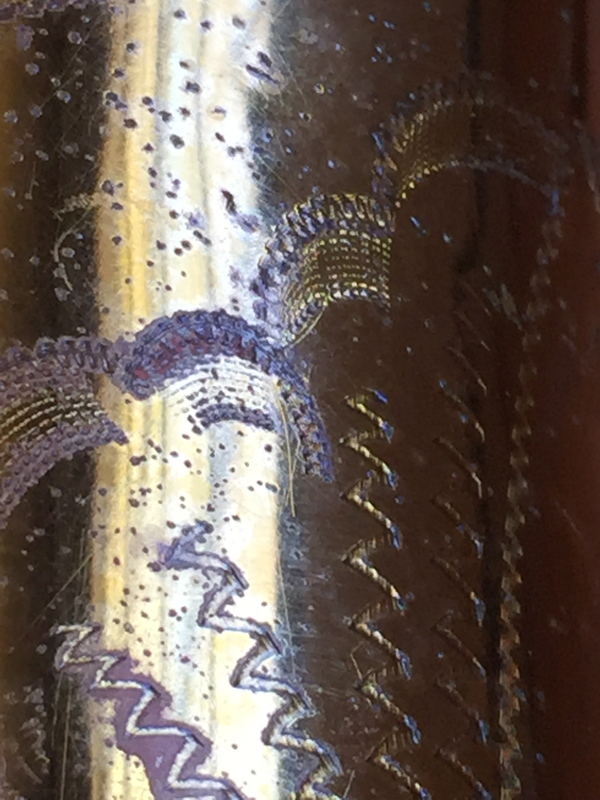 It has slightly domed Nickel plater ( I think) metal resonators of which kind I am rally not sure. 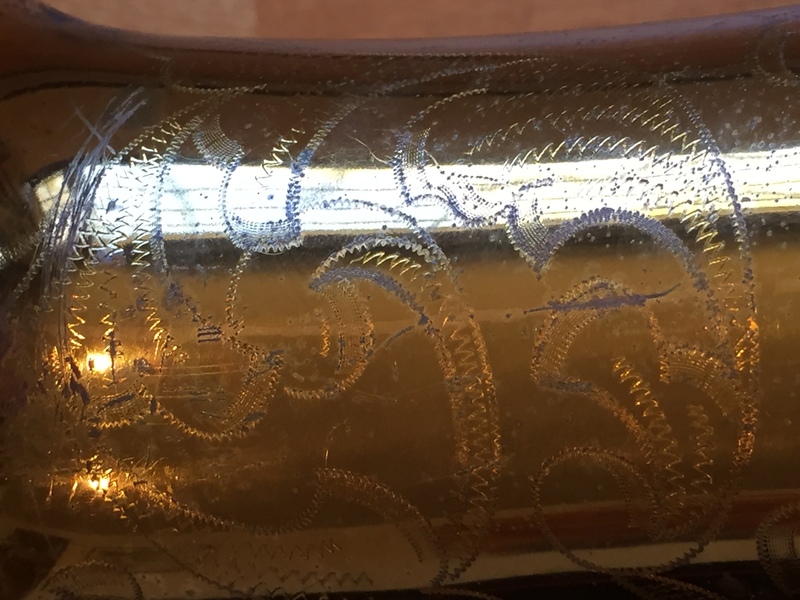 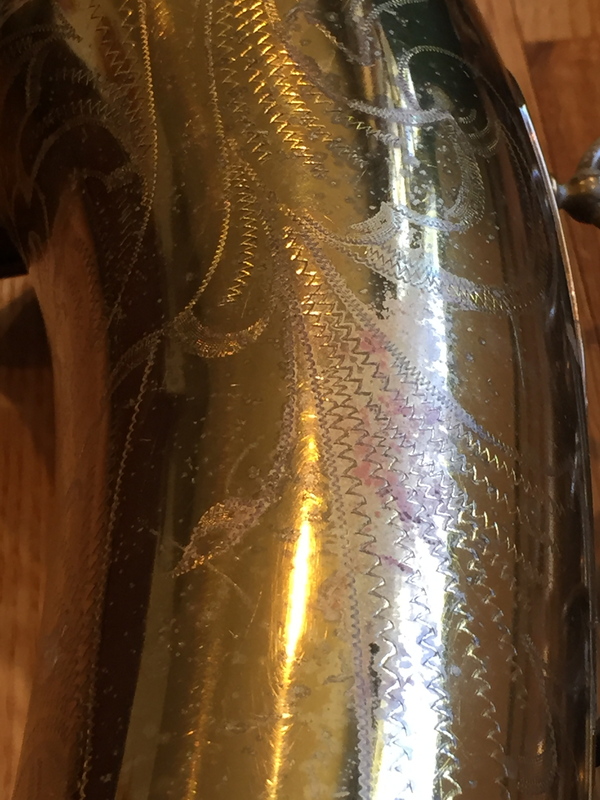 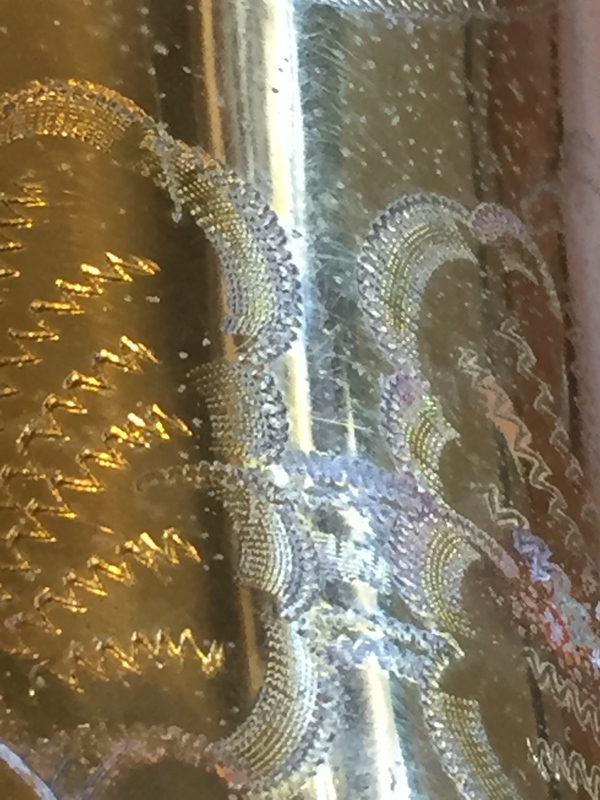 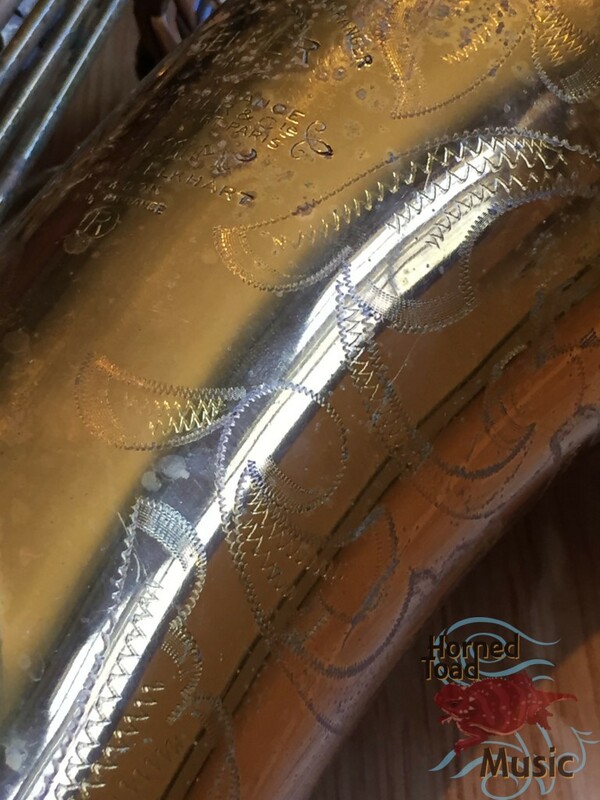 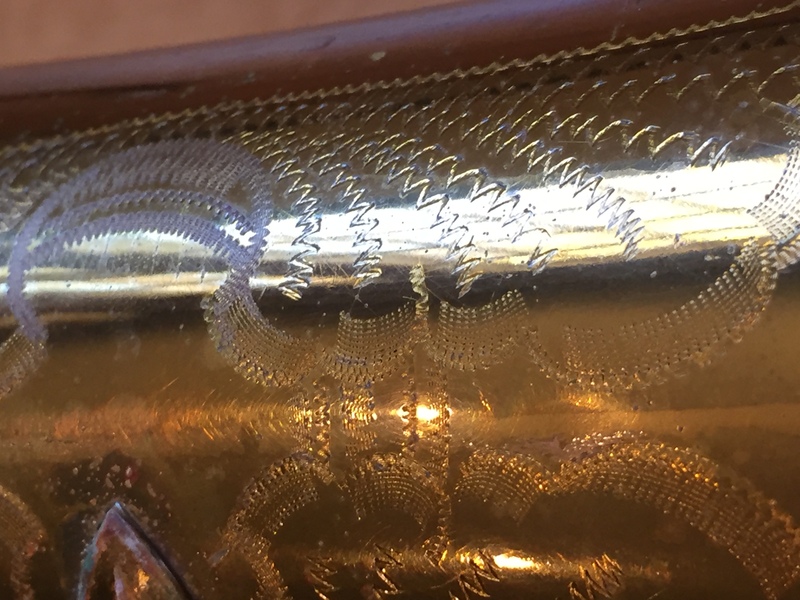 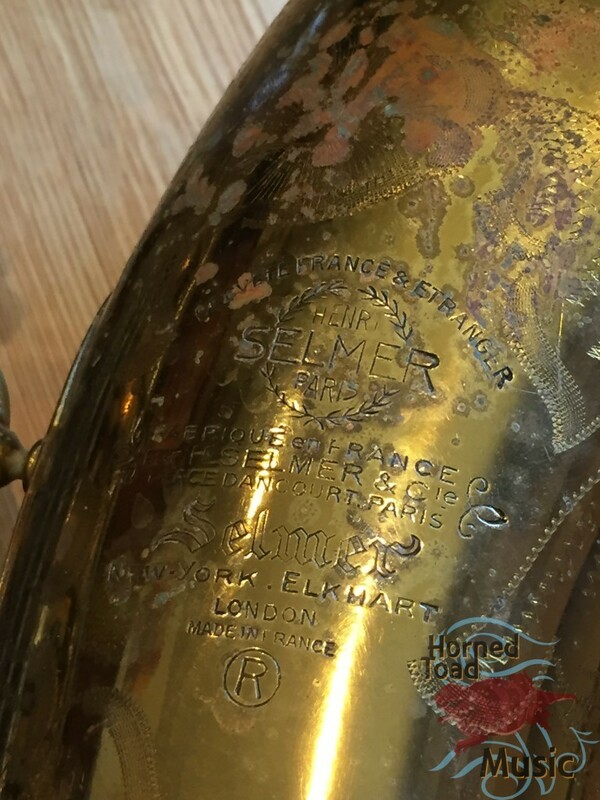 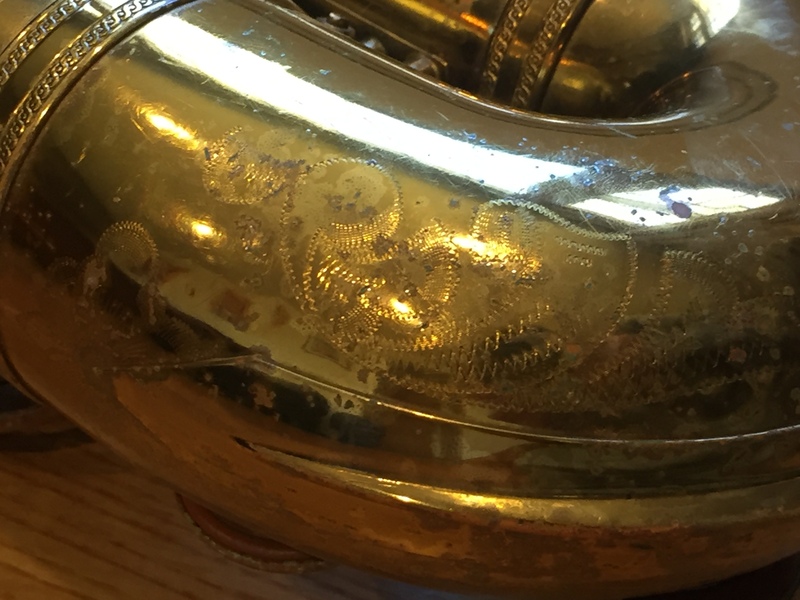 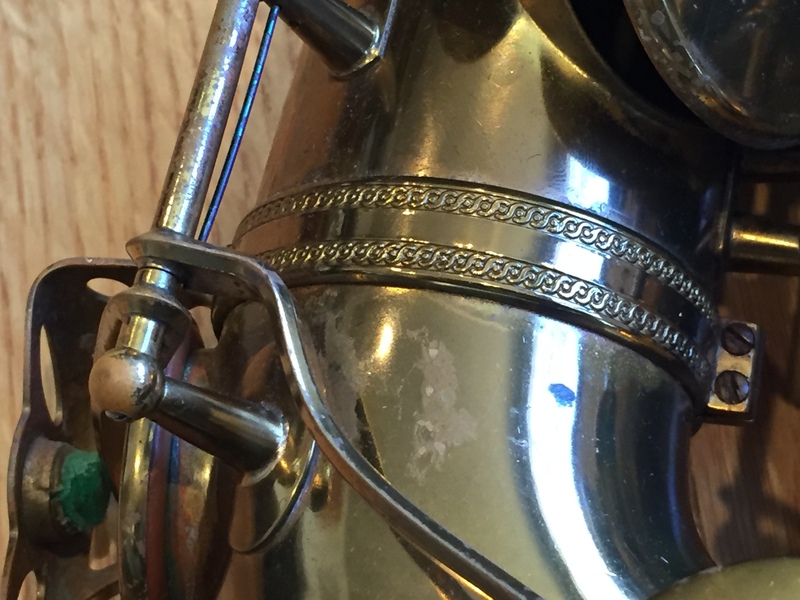 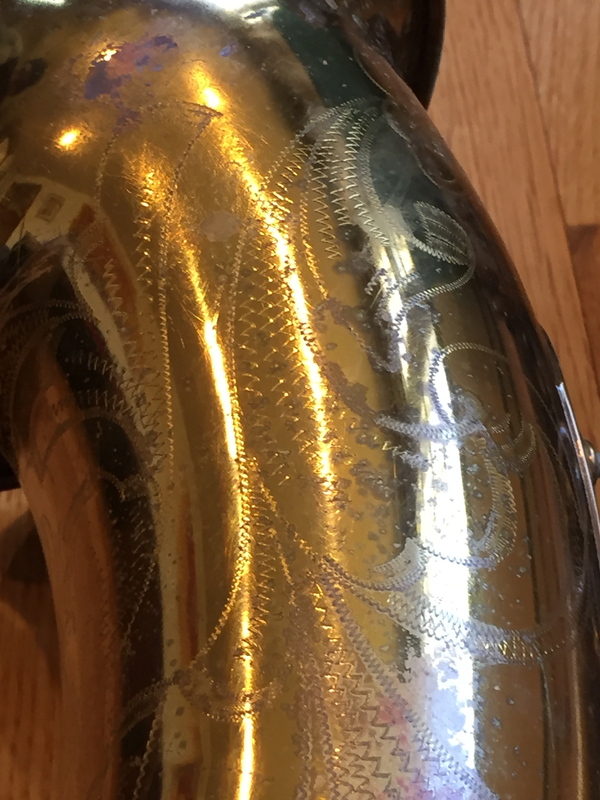 The neck is absolutely the original neck, yet being a French market horn there is no stamped number. Usually it is scribed under the cork or inside the tenon. 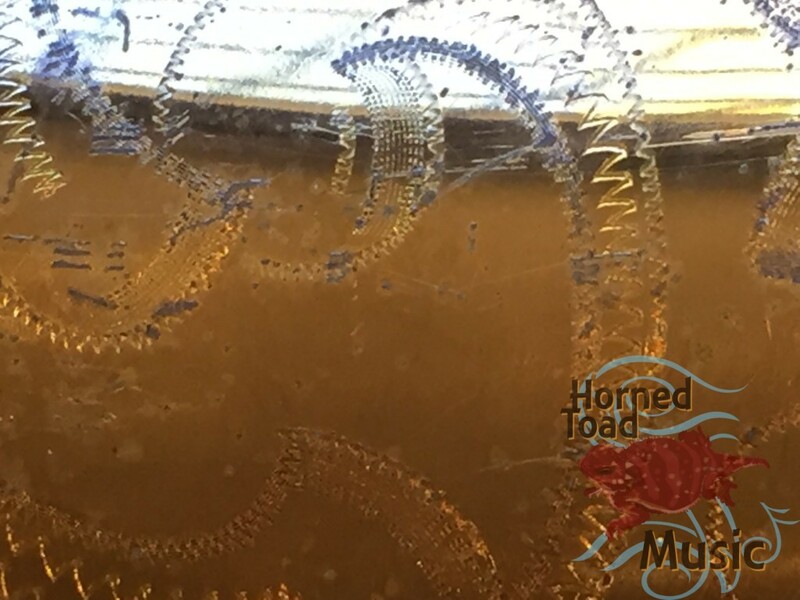 It has a very spread and elastic response that only these very early ones have. 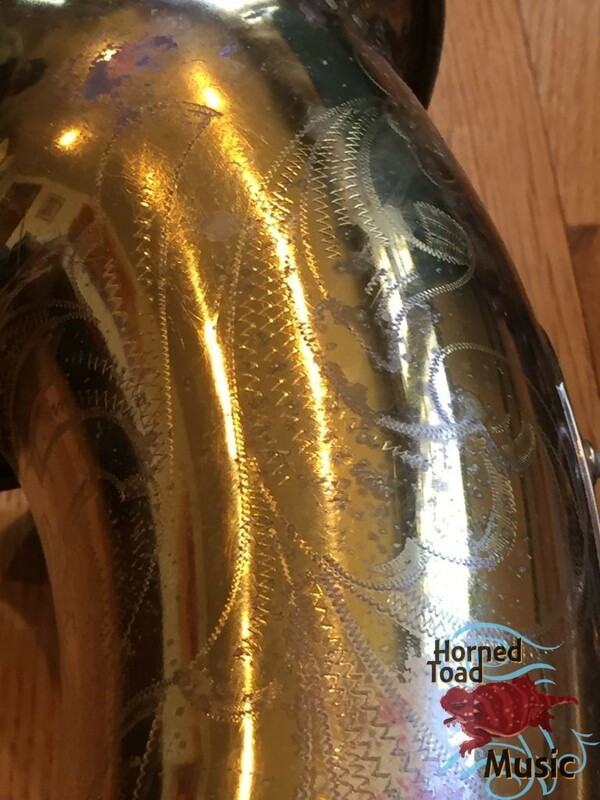 It is not a terribly dark horn, actually very very lively with a warm bright vibration over a lush and organic sounding darker center. 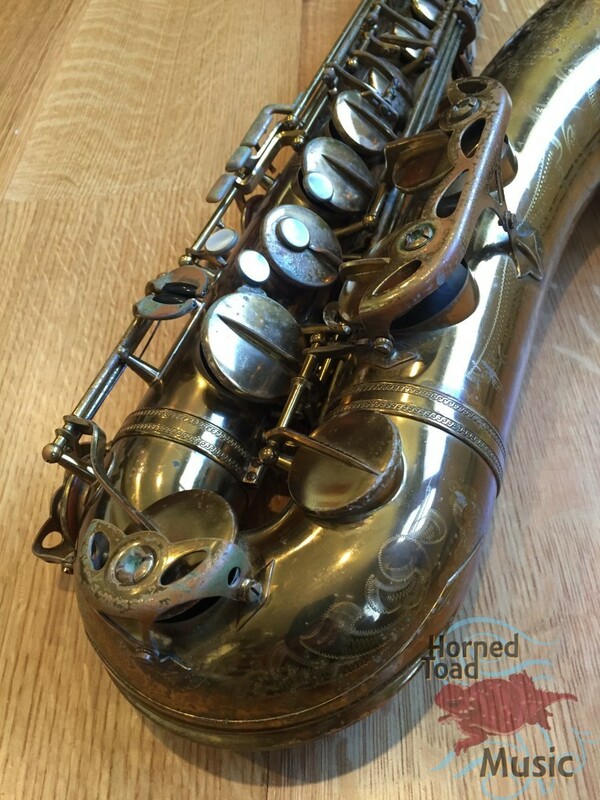 It is also a very loud instrument, while some of the earlier horns are not as loud, this one really is. 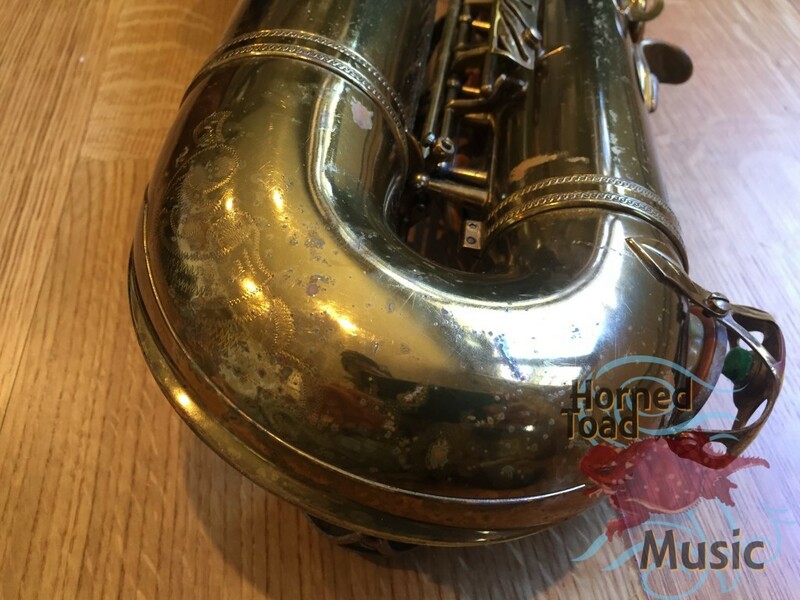 It is worthy of note that his particular horn has about ZERO resistance. 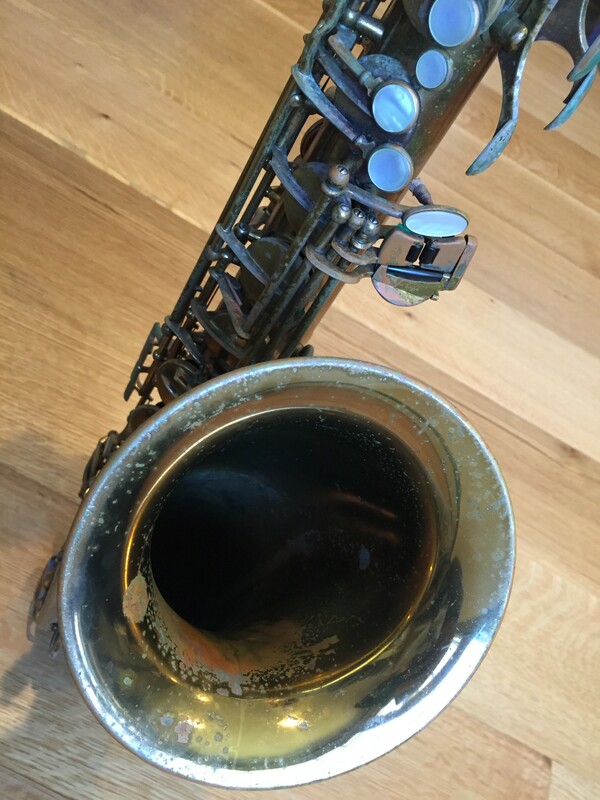 Some people like that some people do not, but it is an extremely easy blow. 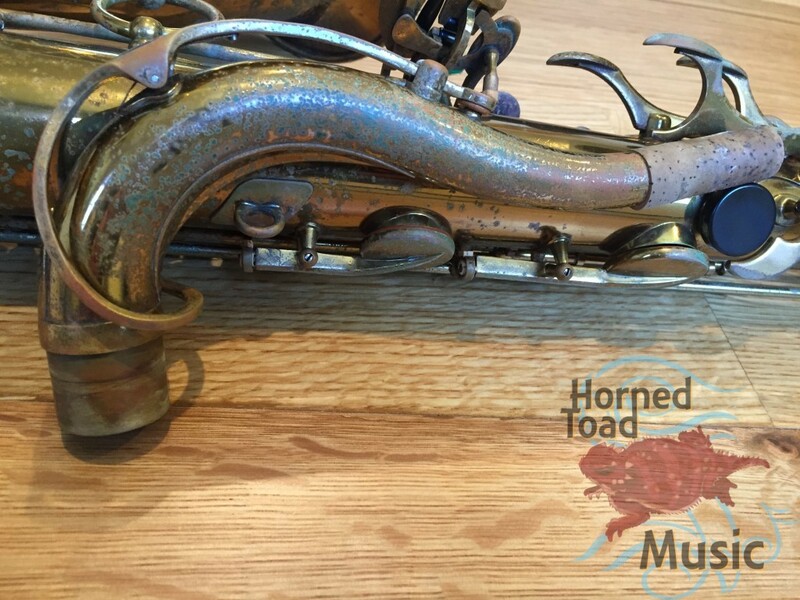 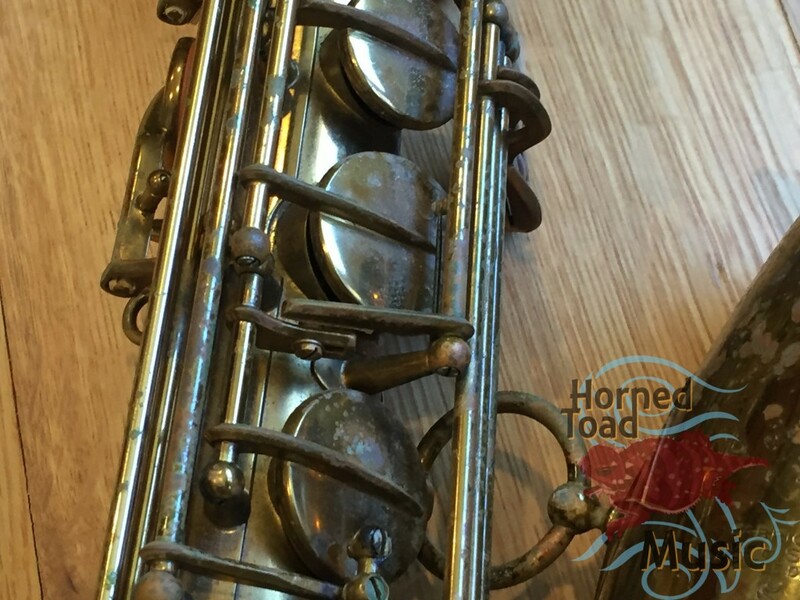 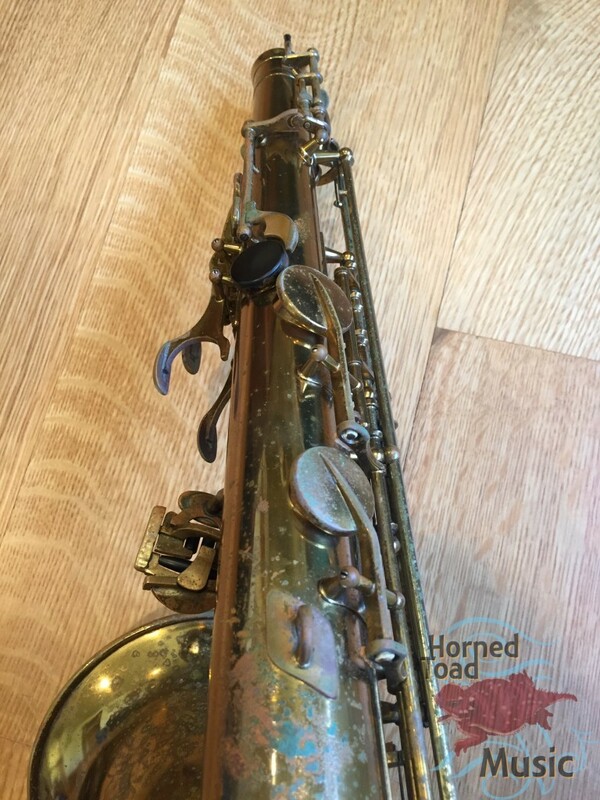 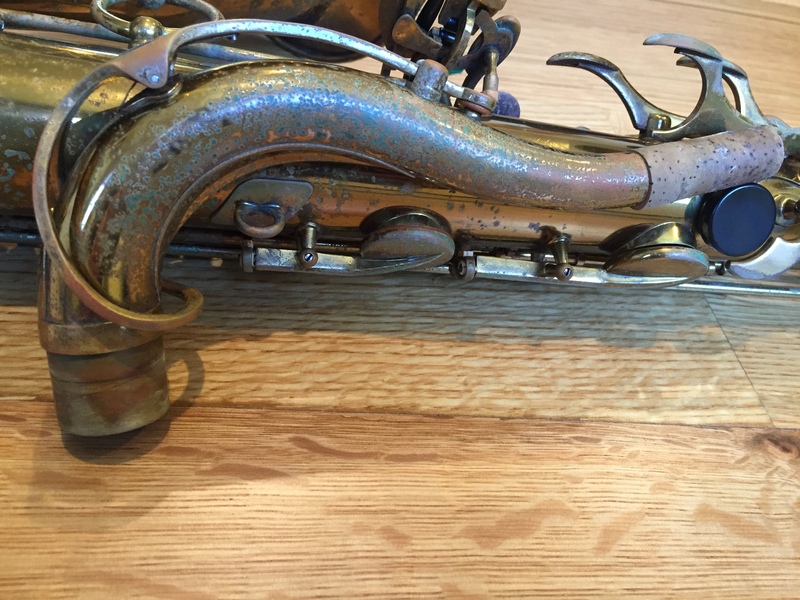 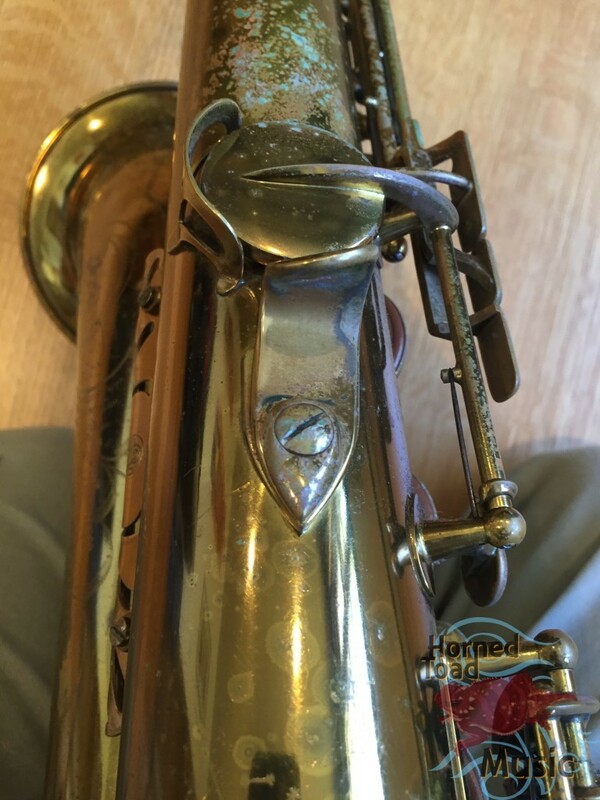 This horn has what I believe is an SBA bell, and perhaps some other areas, body or bow, I really do not know but the way it plays is very similar to the 55xxx-58xxx horns I have played. 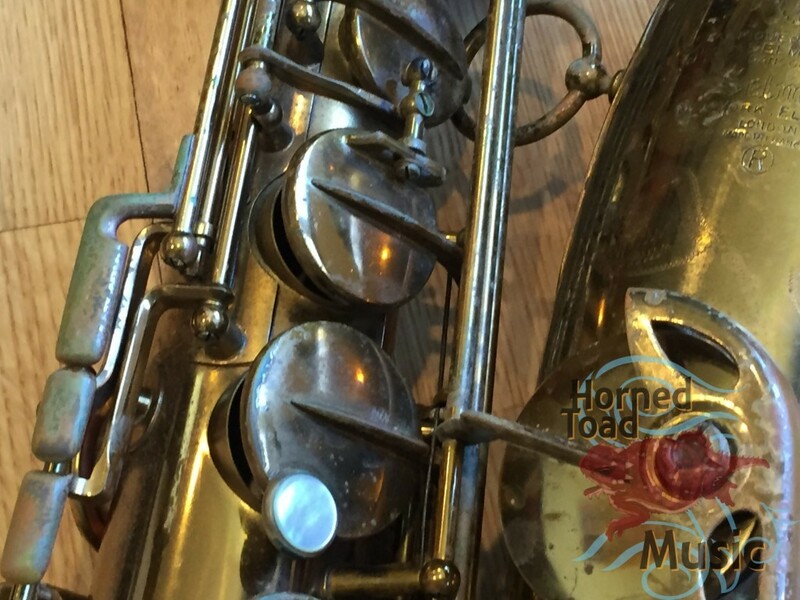 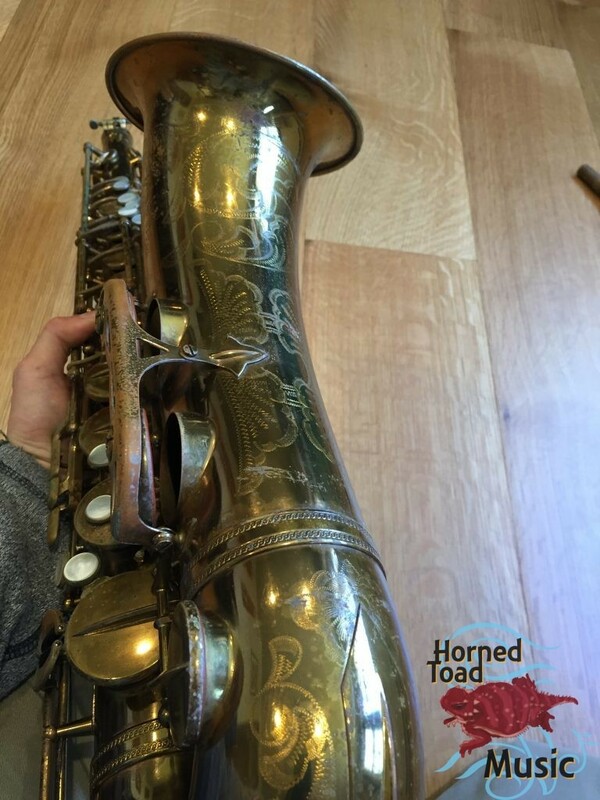 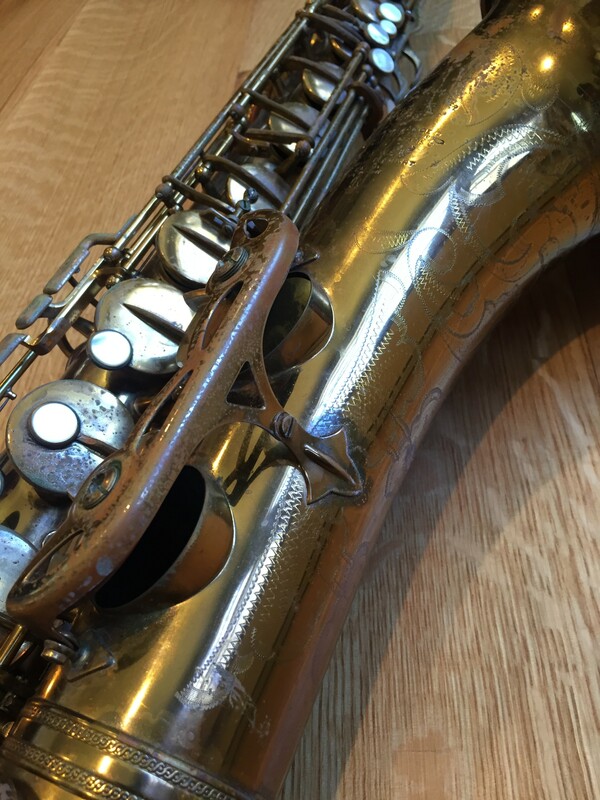 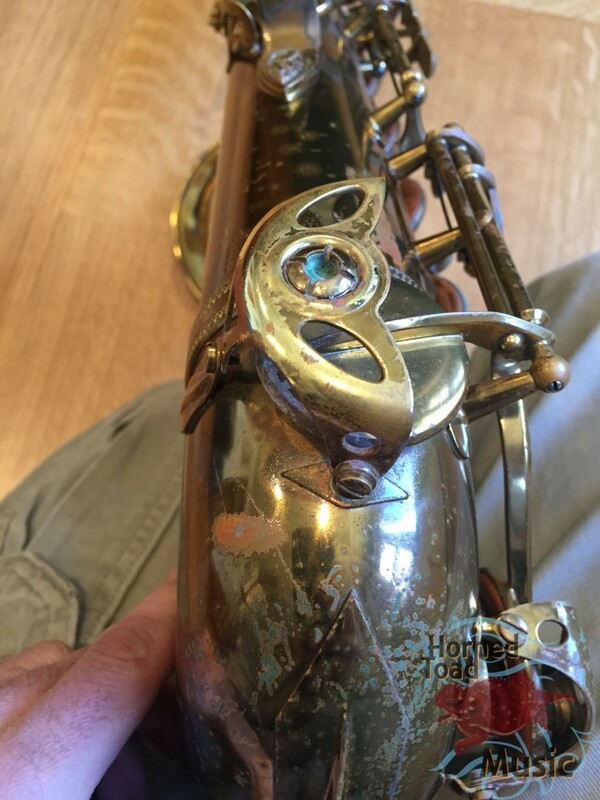 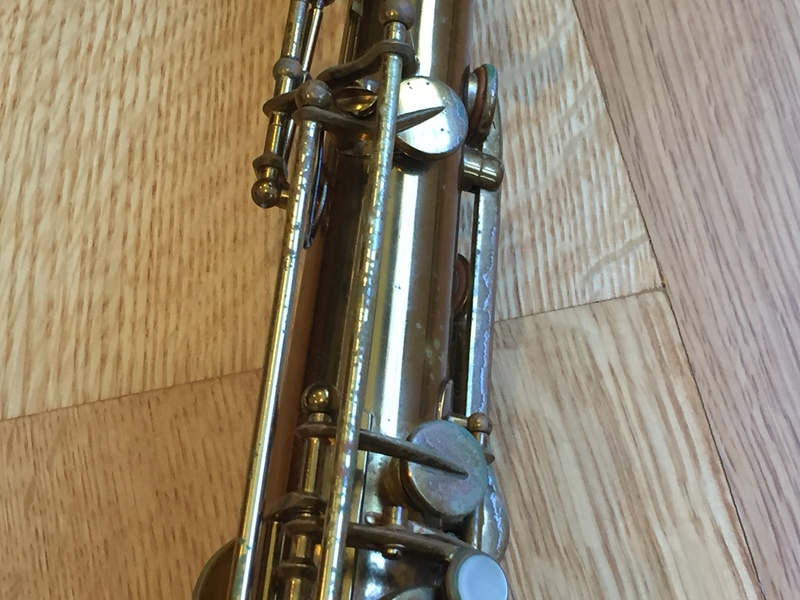 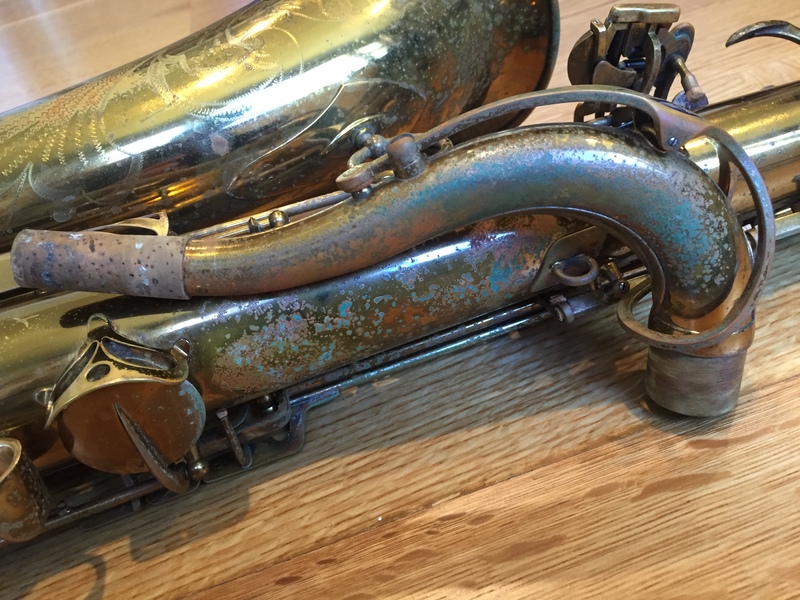 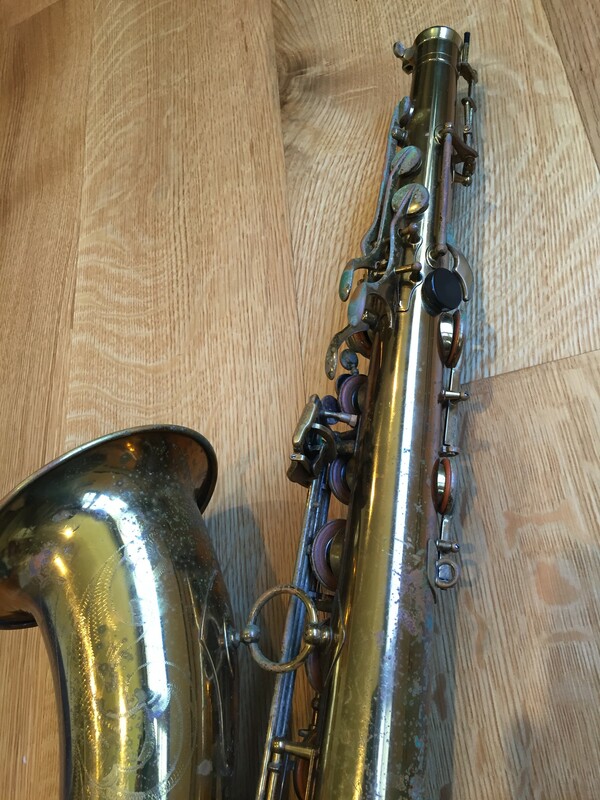 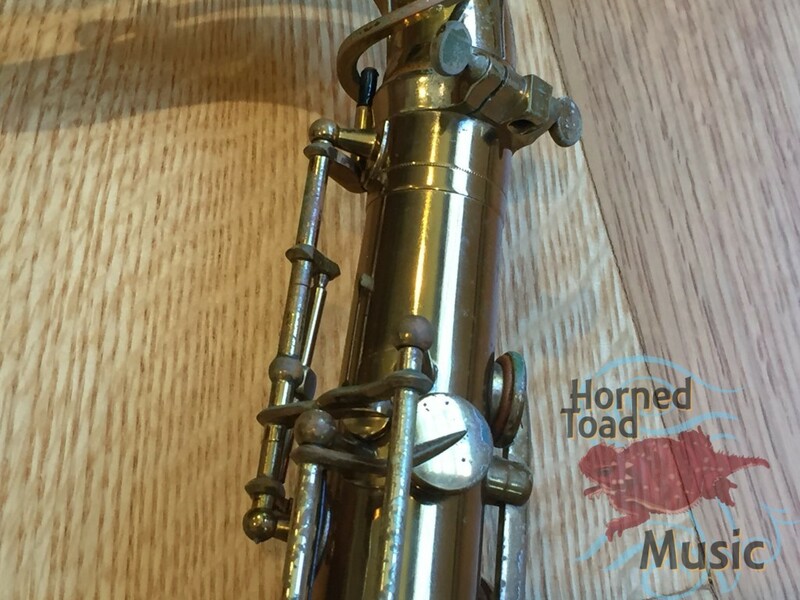 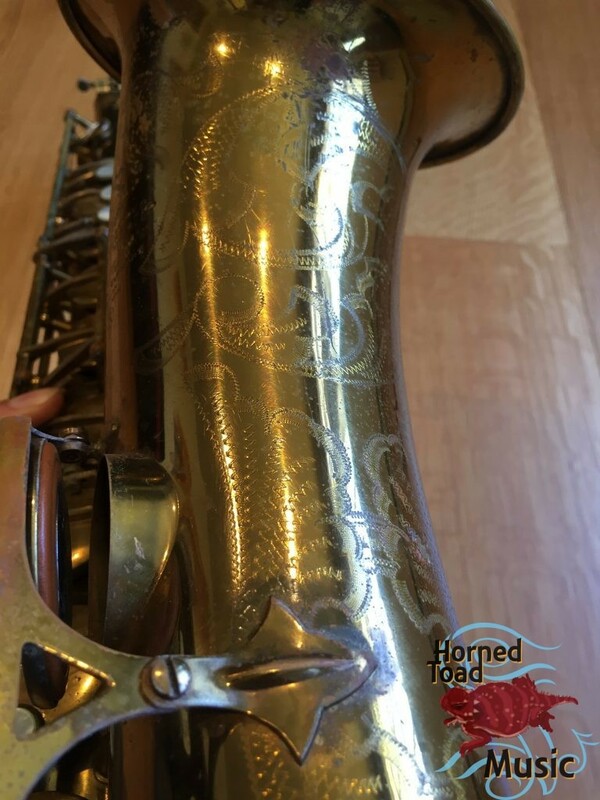 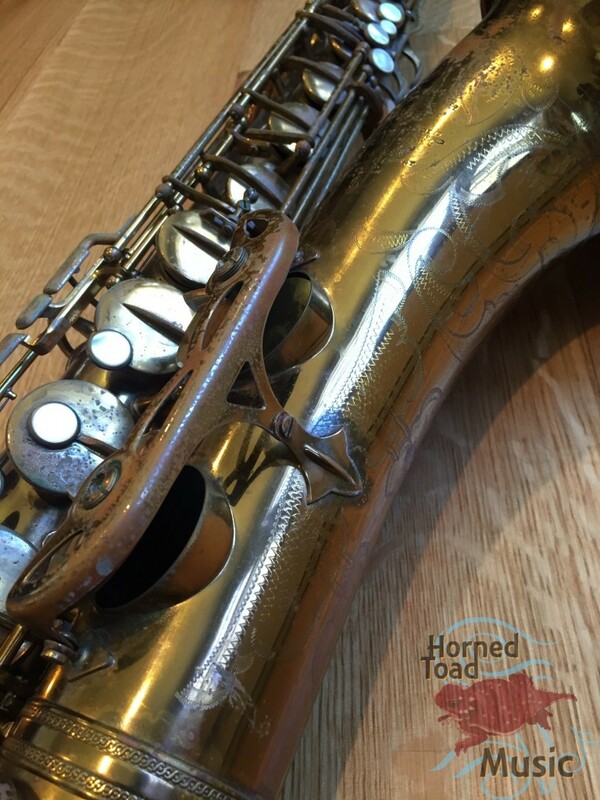 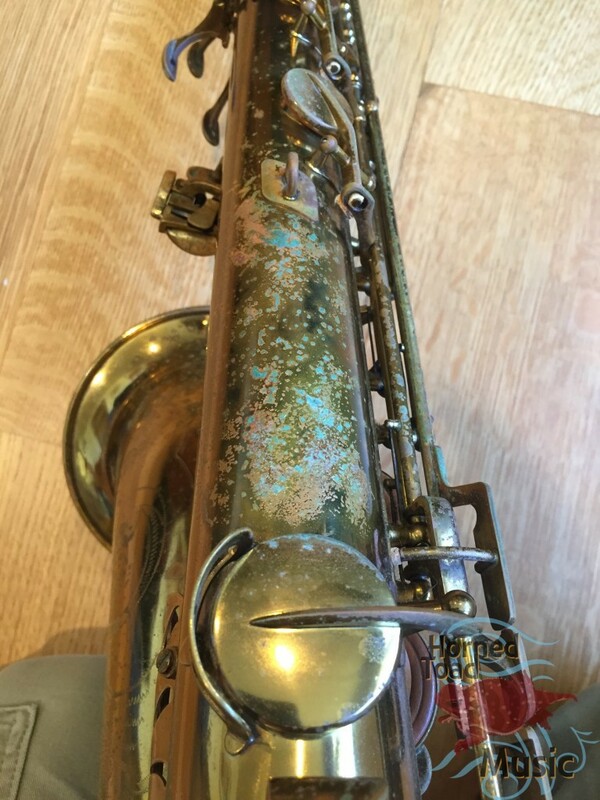 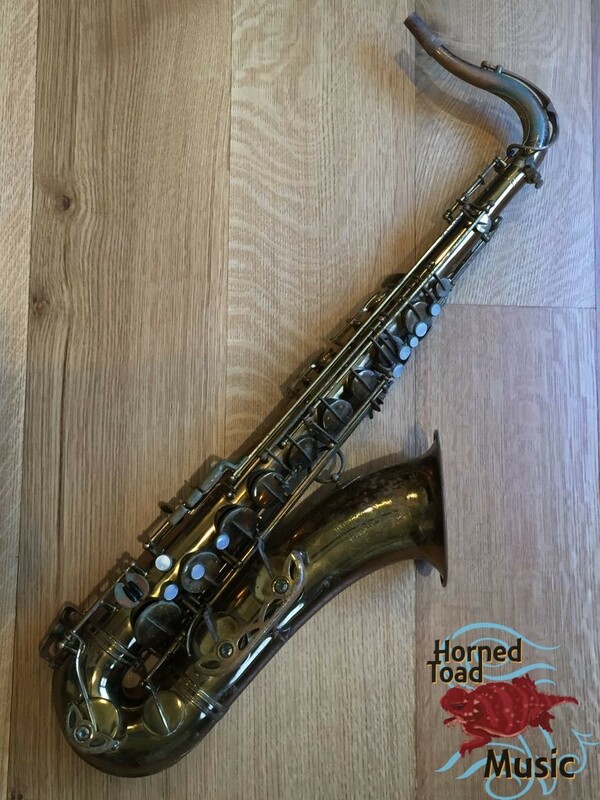 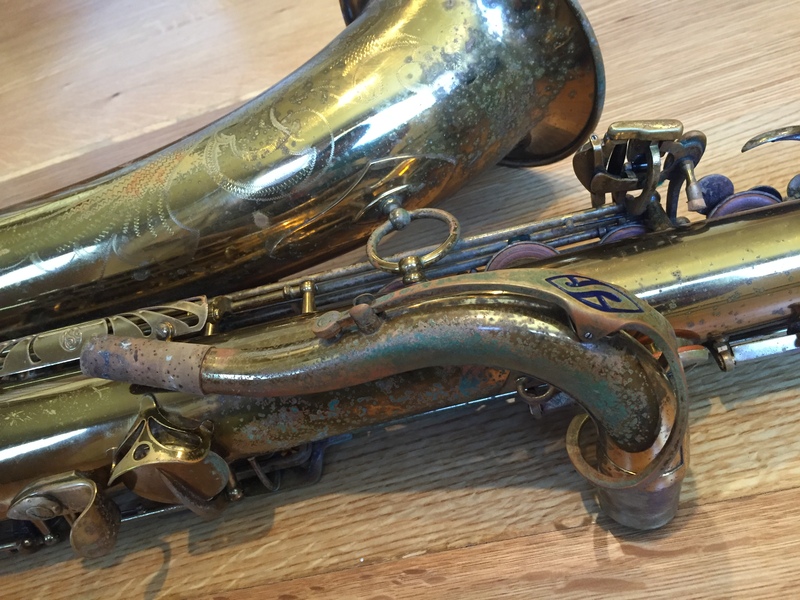 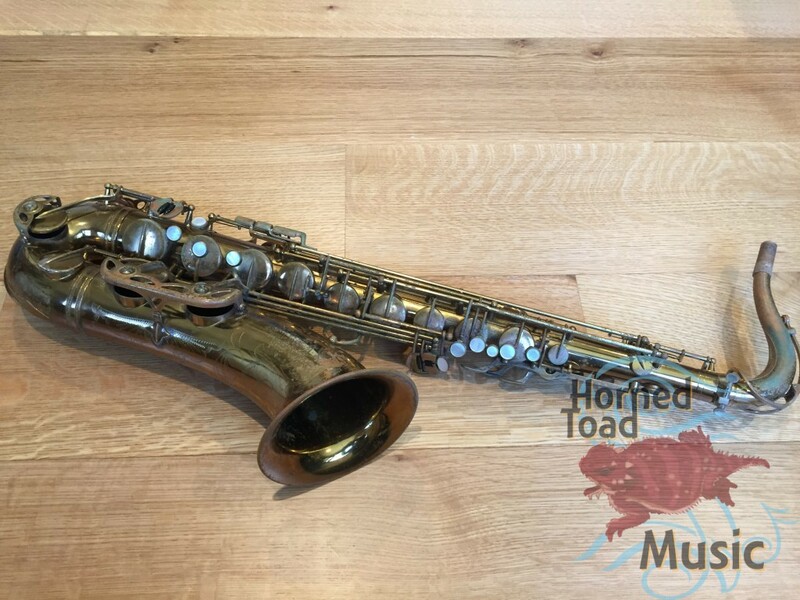 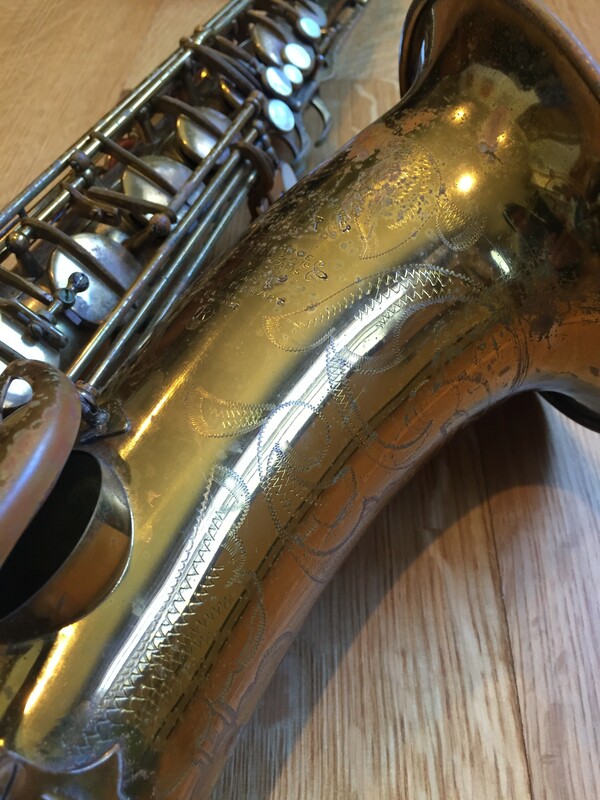 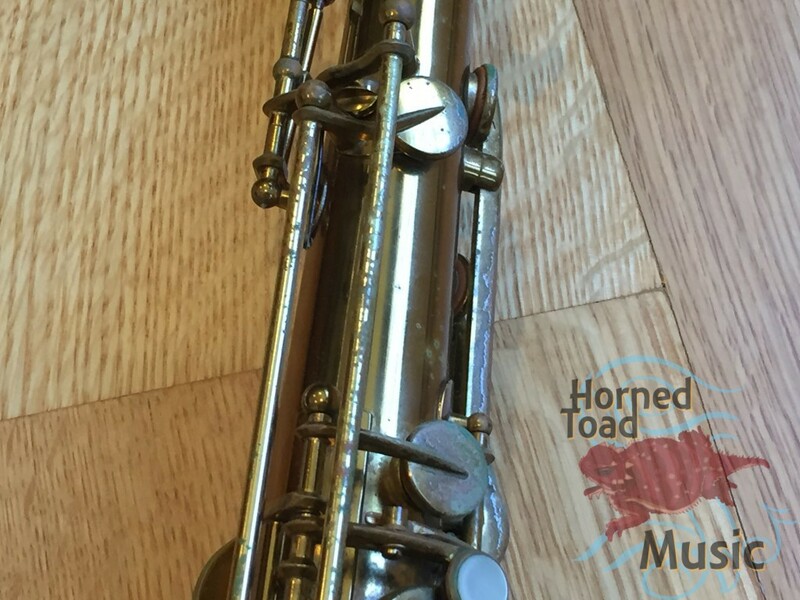 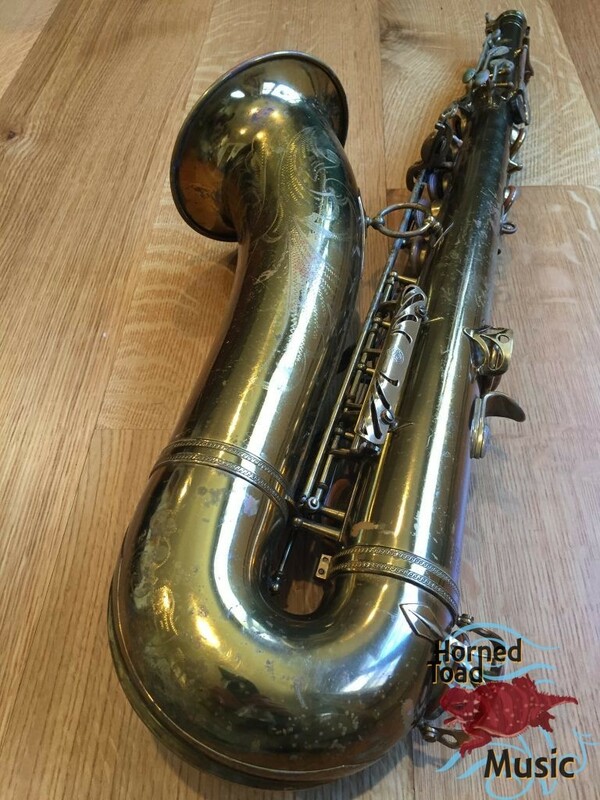 In this early period of the MK VI many of them were actually made out of leftover parts from SBA’s as well, as Selmer was known to use and sell everything. This one, to me, seems to play VERY much as a MK VI but with a sound and elasticity that is very much like SBA. 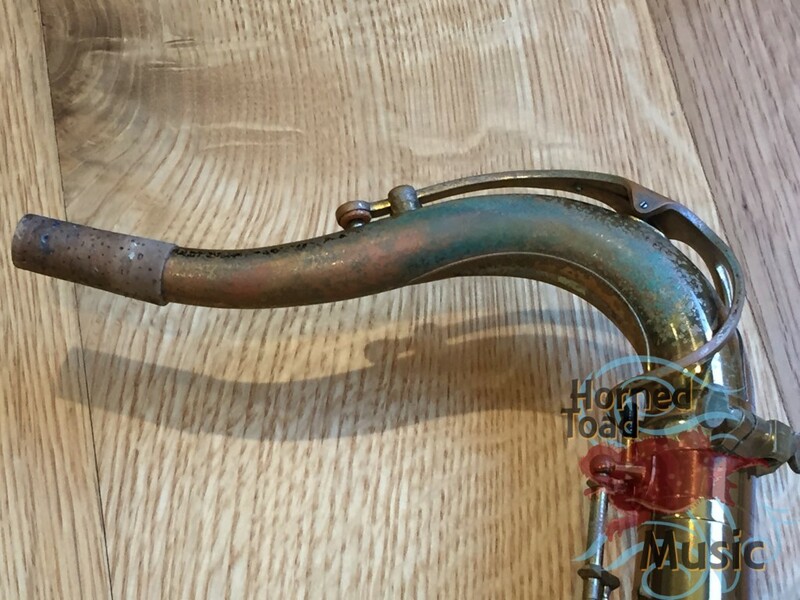 I have gigged on this horn in Jazz, Reggae, Blues, Electric African music etc. 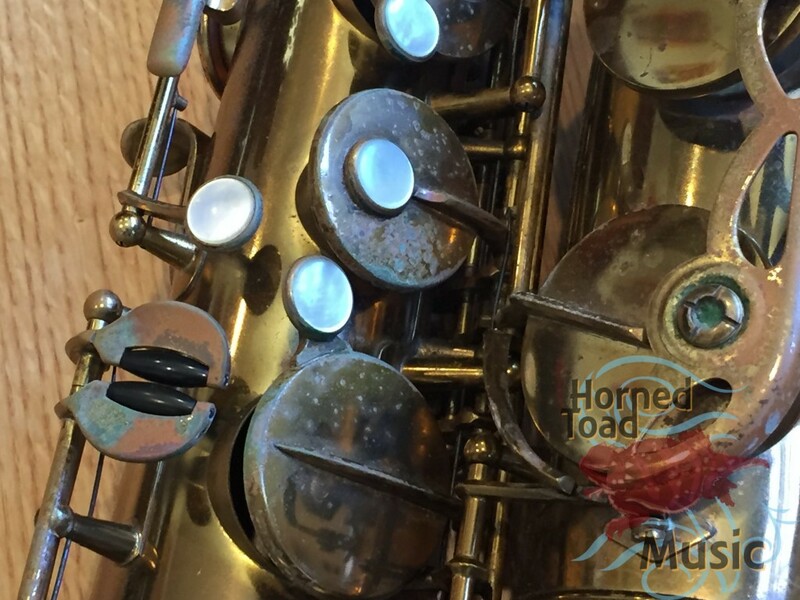 It can survive in any environment and often it was so loud they tried to turn it down (too far) in the mix. 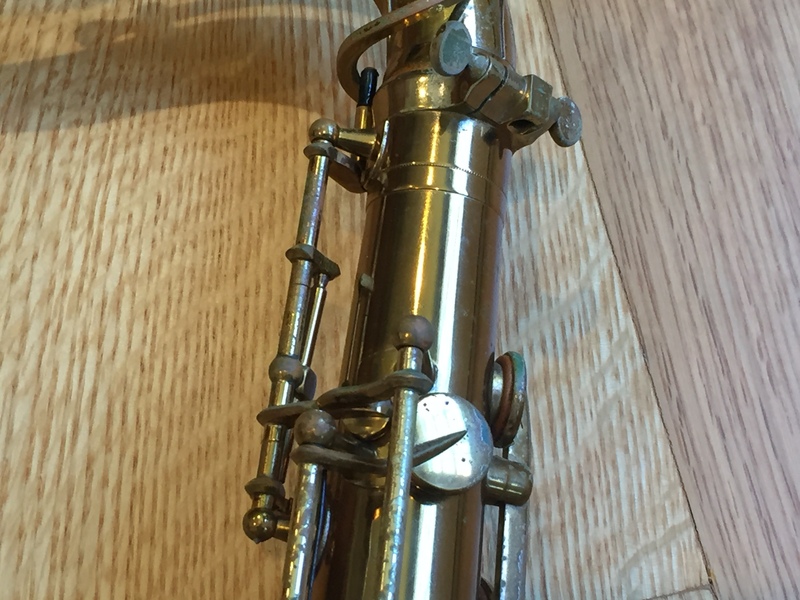 It is NOT a shy instrument. The action is extremely comfortable and fast, and it is easily the best SOUNDING horn I have ever owned. 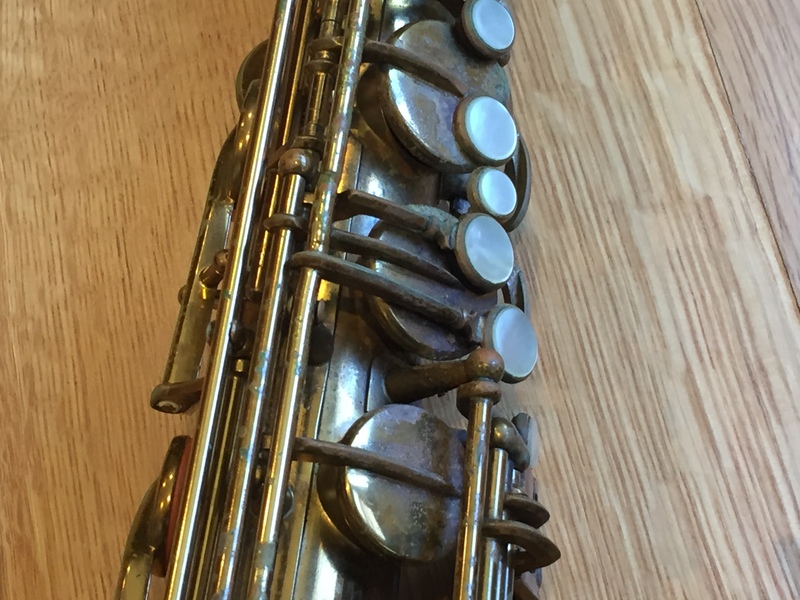 I have held onto it for all these years because, simply I have never played another that was AS GOOD. These days I play on a different type of mouthpiece than I used to and that piece works better with a different horn. 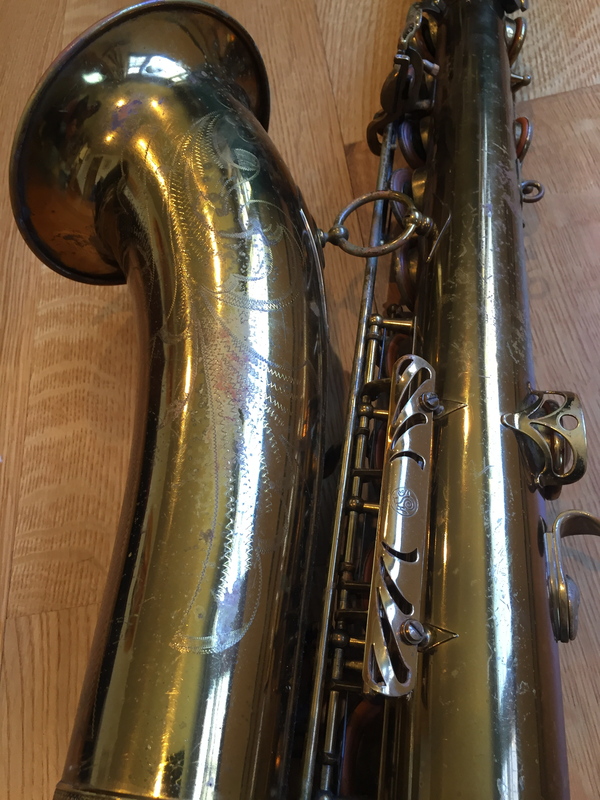 I have just gotten comfortable on that and I figure I really want someone else to play this. 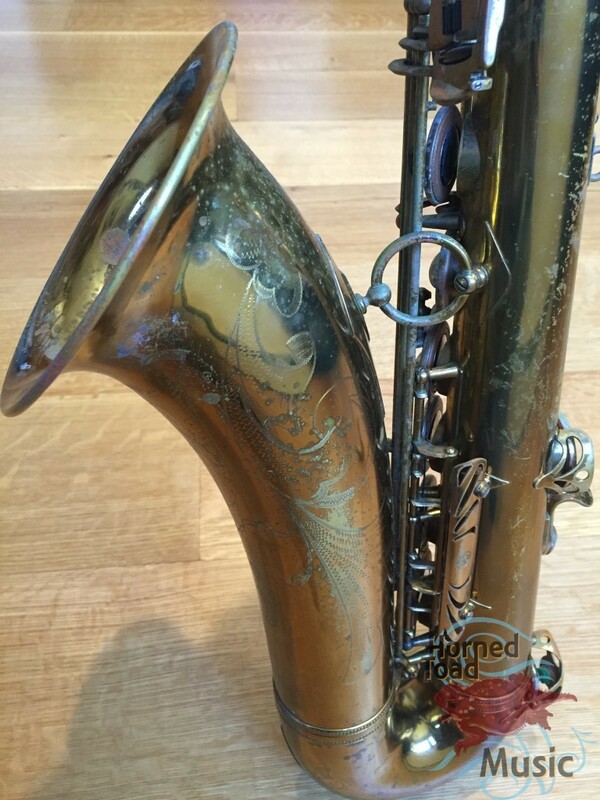 It is just not great to have a horn like this sitting and collecting dust. 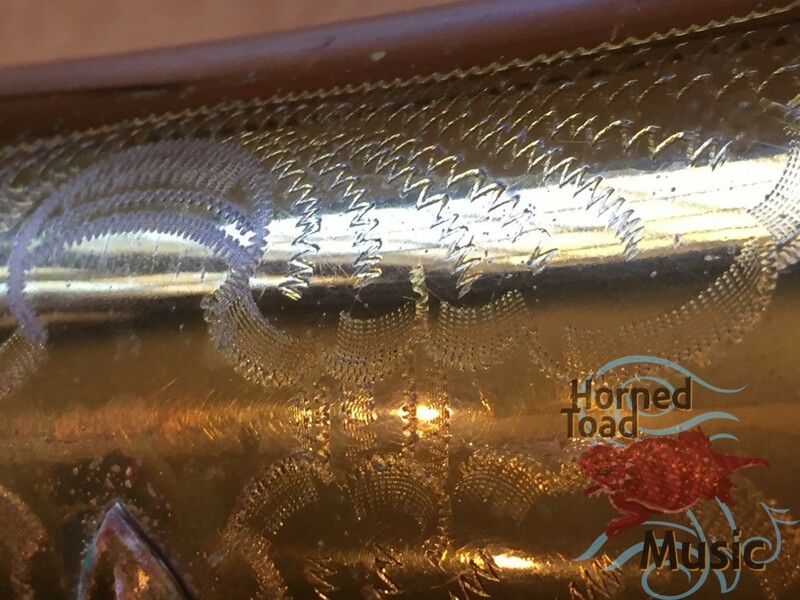 But be advised this is a once in a lifetime find. 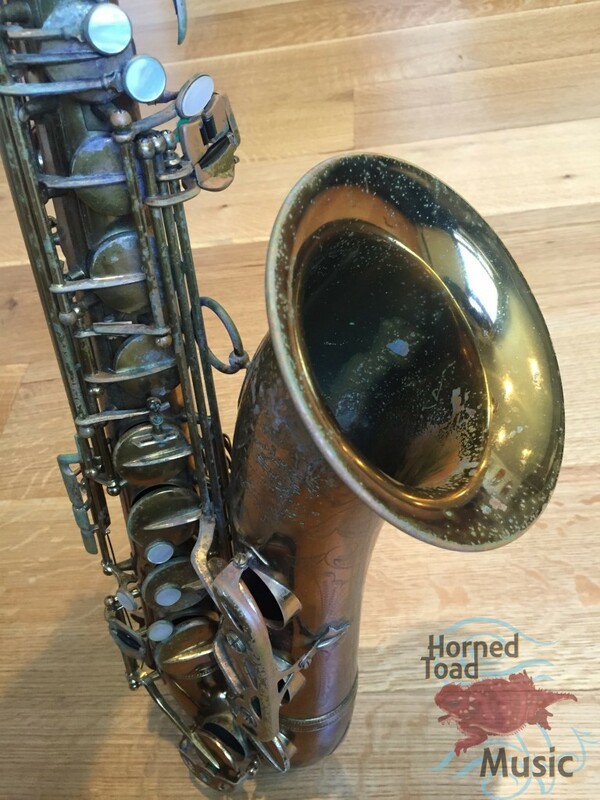 There are different horns out there, but really none better than this. My friend, the late Ernie Sola, who had set up so many vintage Selmers and was also a great player, tried this one and said point blank it was the best MK VI he had ever played. 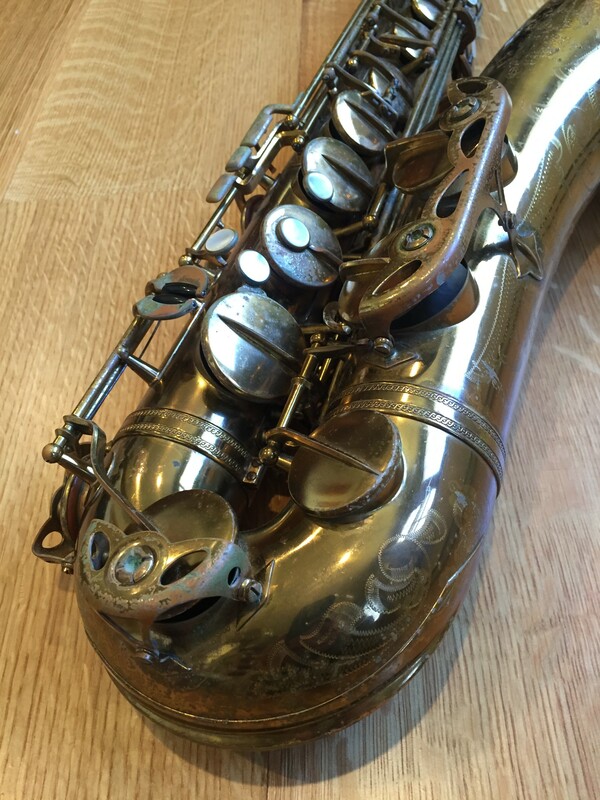 If you are really looking for that original early Selmer vibe this is the one not to miss. 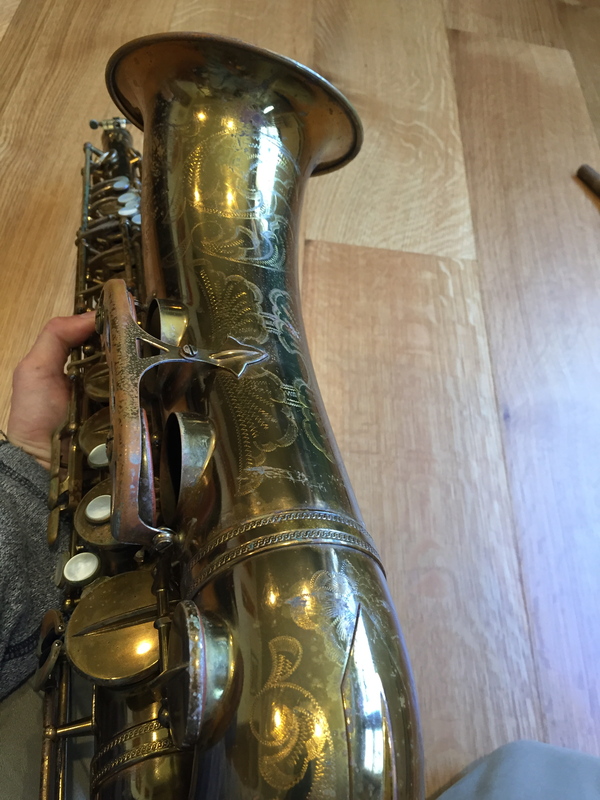 I’ll be happy if it gets played.